I started this website following the creation of the Women Rocking Hollywood at San Diego Comic Con. The origin was, "I've done panels before on subjects I know and want to shine a spotlight on. Why not shine a light on women changing the status quo in Hollywood? With SDCC 2016, we introduced our inaugural Women Rocking Hollywood panel! Women and their position in the pecking order in Hollywood have been much in the news of late. It’s amazing to see the groundswell, the attention, and the realignment happening in the movie industry. Women representing 50 percent of the film directors and creatives, as well as women in front of the camera being paid equally for their work, talent, and star power will only enhance the body of work being left for film historians and movie lovers…shift happens, and it’s happening now. So many powerful, talented women are at the forefront of changing Hollywood from the inside. As creatives, directors, and producers, they are breaking box office records and showing Hollywood that altering the status-quo makes for better movies. These brave women are working to bring equality to tinsel town, and I am working to help them any way I can. With Women Rocking Hollywood, I hope to highlight those doing good work in support of these changes, as well as those actually doing the craft. As Cinema Siren, and in my work with Animation Scoop, I be post interviews and articles about women in film and animation, as well as provide links, articles, and anything else I can post that enlightens those looking to help create a better world for all artists working in cinema. Leslie is the founder and moderator of Women Rocking Hollywood. She facilitates the annual Women Rocking Hollywood panel at San Diego Comic Con, interviews important female and LGBT+ figures in the film and television industry, and she advocates for the recognition and advancement of women in the media world. 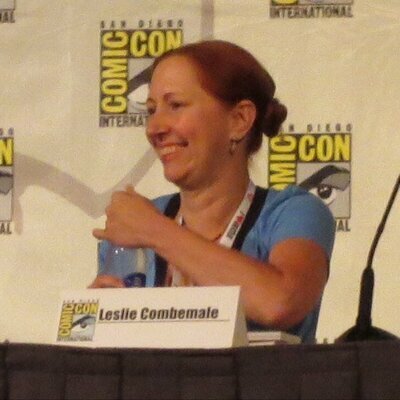 In addition to her work with Women Rocking Hollywood, Leslie also writes movie reviews and conducts film maker interviews for her website Cinema Siren, for the MPAA's TheCredits, and for Animation Scoop. Leslie also owns the ArtInsights Gallery, which represents and sells film production art.